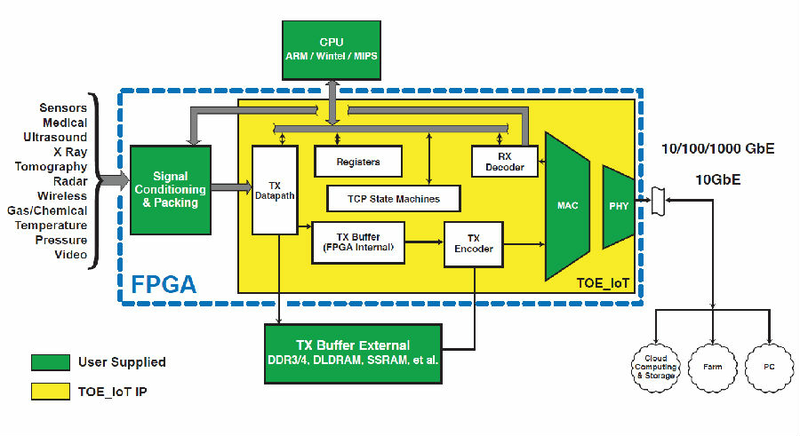 The purpose is to offload the TCP/IP function from the embedded CPU and perform it directly in FPGA-based hardware. This IP is specifically optimized for embedded, IoT applications where high data bandwidth and/or guaranteed latency is required. TOE_IoT does this by eliminating the need for host processor intervention when analyzing data packets. This IP is designed to be utilized in FPGA-based embedded, IoT-type appliances where guaranteed latency and/or high bandwidth data movement in a standard network is required. When configured with appropriate networking HW, the TOE_IoT can achieve 90% loading with guaranteed latency. The TOE_IoT works at the full 10GbE line rate and was developed internally at DINI Group. Consult the factory for 40 GbE and 100 GbE performance specifications. TCP Offload is useful in embedded system where the data throughput requirements exceed the embedded processor.s ability to service. Data critical functions are moved and executed directly in the FPGA. Infrequent, non-data TCP/IP functions such as setup/teardown, ARP, ping, DHCP, et al) are passed through to the (required) embedded CPU. At the intended target frequency of 156.25 MHz, the TOE_IoT operates at the full 10GbE line rate, generating no Ethernet pause frames. Ø AXI, PCIe et al. Ø ARP, ping, DHCP, SMTP, et. al. l DDR4, DDR3, RLDRAM, SSRAM, et al. Ø 128/256-bit on roadmap for 40/100 GbE.